Make noise when you are outdoors and the bear will avoid you. Sing, talk to yourself or others while you are hiking. The bear will hear you and normally run away before you see him. Any surprised or wounded bear, a bear with cubs, a bear eating a carcass and bears confronted with dogs can be aggressive. 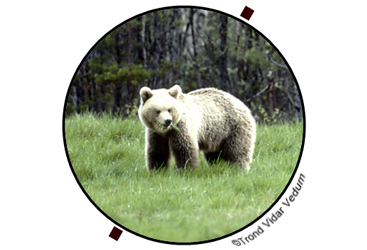 Loud noise or a warning shot can frighten the bear but it could also stress or irritate the animal to attack. Be calm and avoid abrupt movements. Make slow movements, and don’t stretch your arms in the air because the bear may see this as a provocation. Get out of the area calmly. When you have become aware of a bear you should get away from the area. When the bear stands up on its two hind legs, it is checking you out. Start to walk slowly backwards without turning completely. This way you still can see what the bear is doing. Don’t present yourself as a prey. The bear will think you are prey if you try to run away or turn your back to the bear. Throw items or clothing or other things into the path of the bear if the bear starts to follow you. The bear will stop to investigate your things and, hopefully, lose interest because of the human odor. Play dead. When all other tricks fail, this is your last resort. Curl together in a fetus position with your knees up under your chin and your arms covering your neck and head. The bear will check how you smell and perhaps bite you in order to check if you really are dead. If the bear thinks you are dead it will most likely walk on. Avoid climbing trees. The bear is good at climbing trees. To try saving yourself up a tree is a bad alternative. The abrupt movements may irritate the bear and you may not be able to climb the tree in time. Don’t jump in the water. The bear is a good swimmer. The bear could follow you into the water and the water in itself is hazardous for people in panic. Don’t throw objects at the bear. You may hit the bear and provoke an attack. Don’t leave leftovers around. Keep food in tight containers to minimize odors. Take your garbage with you. If the bear is accustomed to easy food provided by people, it will come back for more later and be less afraid of people. Cancel the trip after encountering a bear. If you have met a bear, it is wise to cancel the rest of the trip and report the bear to the authorities. A second encounter on one trip could result in a bear attack. Have you every meet a bear in the wild? The next time I read a weblog, I hope that it doesnt disappoint me as considerably as this 1. I mean, I know it was my option to read, but I essentially thought youd have something interesting to say. All I hear can be a bunch of whining about something that you simply could fix if you happen to werent too busy searching for attention. You produced some decent points there. I looked on the net for the problem and discovered most people will go along with along with your web page. Spot on with this write-up, I truly feel this web-site requirements a lot more consideration. I’ll possibly be again to read far more, thanks for that info.